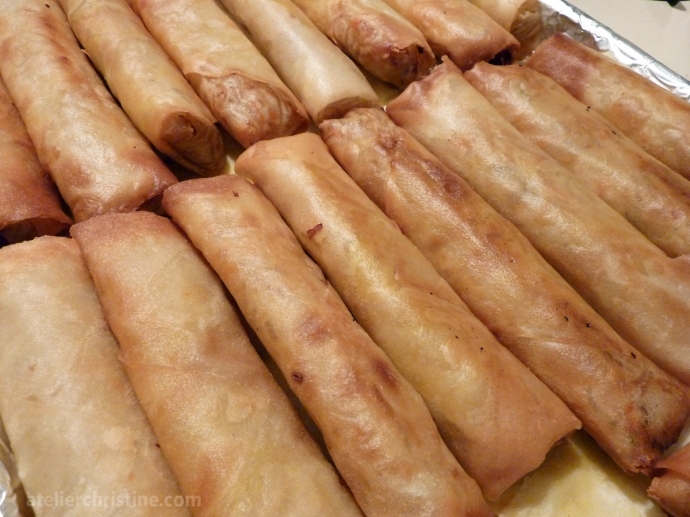 You can call them egg rolls or spring rolls, depending on what part of the world you come from; but here in the United States, egg roll is most commonly used for any vegetable and meat combination wrapped up in dough and fried. This particular deep-fried roll recipe contains shrimp, pork, noodles and lots of vegetables. 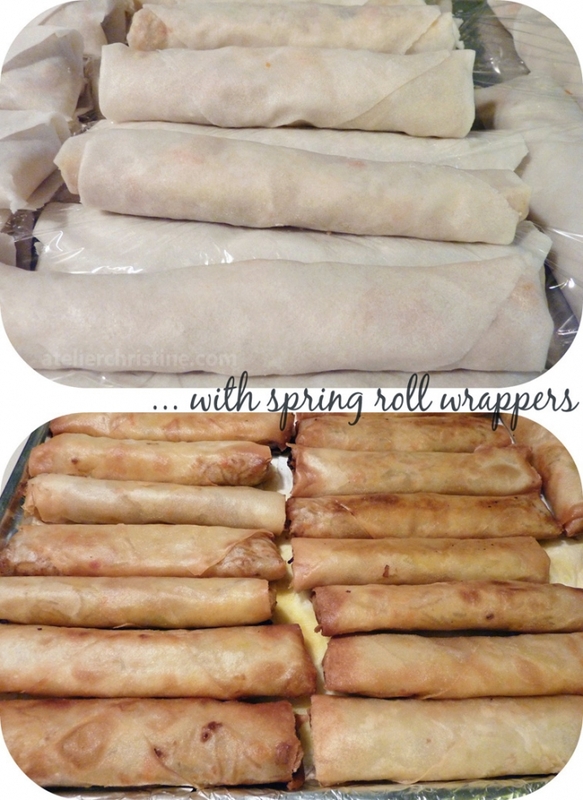 You can use either egg roll wrappers or spring roll wrappers. But wait a second, what is the difference between egg rolls and spring rolls? Egg rolls are made with thicker yellowish in color wrappers that are made from wheat flour, eggs and water and usually contain meat. They are rolled thick, fry up crispy, have a dark golden brown textured surface and must be served hot. Did you know that many food scholars believe that the egg roll is an American original! Quite a few American-Chinese fried foods like egg rolls, crab Rangoon, sweet-and-sour pork and General Tso’s chicken are rarely, if ever, seen in authentic Chinese cuisine. Since we are still on the subject, there’s more: the infamous fortune cookie is actually Japanese-American. “Makato Hagiwara, who designed (and for many years lived in) the Japanese Tea Garden in San Francisco’s Golden Gate Park, invented the fortune cookie in the early 20th century. He intended the cookie to be a snack for people walking through the tea garden, but the concept became so popular that Chinese restaurants in San Francisco’s Chinatown stole the idea” (source: mental_floss magazine). Now, unlike the egg roll, spring rolls are Chinese. Spring rolls are made with thinner grayer in color translucent wrappers that are made from just wheat flour and water, are vegetarian, and usually contain bean sprouts. They are rolled thin, fry up crispier, have a flaky golden smoother surface and can be served hot or cold. So let’s get down to the recipe. Gather all your ingredients and prep as required. Oh boy, I’m drooling already! 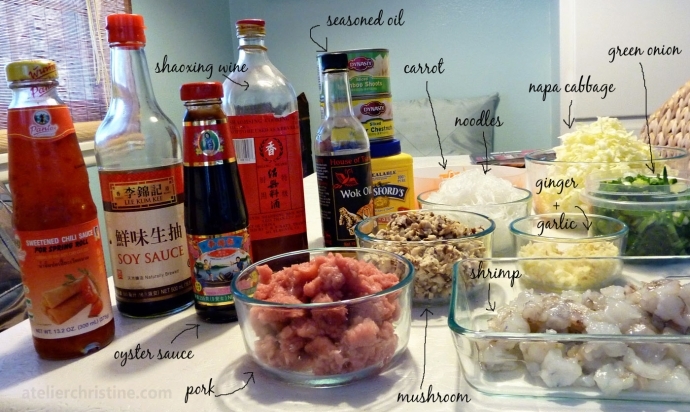 This is hands down my favorite egg roll recipe. Get started on the filling; stir-fry one ingredient after the other, until it all comes together. Now start folding and rolling. And finally, deep-fry (or bake) until crispy and golden in color. Soak noodles in hot water for about 6 minutes until pliable (read package instructions); rinse with several changes of cold water, drain and cut into 2” pieces. Soak mushrooms in several changes of hot water for about 20 minutes; drain, pat dry and slice. Set both aside until ready to use. Prepare filling. Heat oil in a large wok or pan until smoky, add garlic and ginger; stir-fry for a minute until fragrant. Add pork; cook 3 minutes. Add shrimp; cook 3 minutes. Add next eight ingredients; cook 2 minutes. Season with salt and pepper; stir in mushrooms and noodles. Transfer filling onto a rimmed platter, tilt platter as you scoop filling to one side and pat dry any excess liquid (if any) with paper towels. Cool completely. Assemble rolls. Keep wrappers covered with a damp cloth while working to prevent drying. Lay one wrapper with the corner pointed at you. Place about 3 tablespoons filling just below the center and spread horizontally; fold pointed corner over to just under filling. Fold the same corner up tightly over filling. Brush edges with cornstarch sealing paste. Fold left and right corners toward the center and continue to roll. Roll tightly so oil doesn’t seep inside; repeat. Arrange seam-side down on a cornstarch dusted baking sheet, separating each layer with plastic wrap (rolls can be frozen at this point or refrigerated for up to 4 hours). 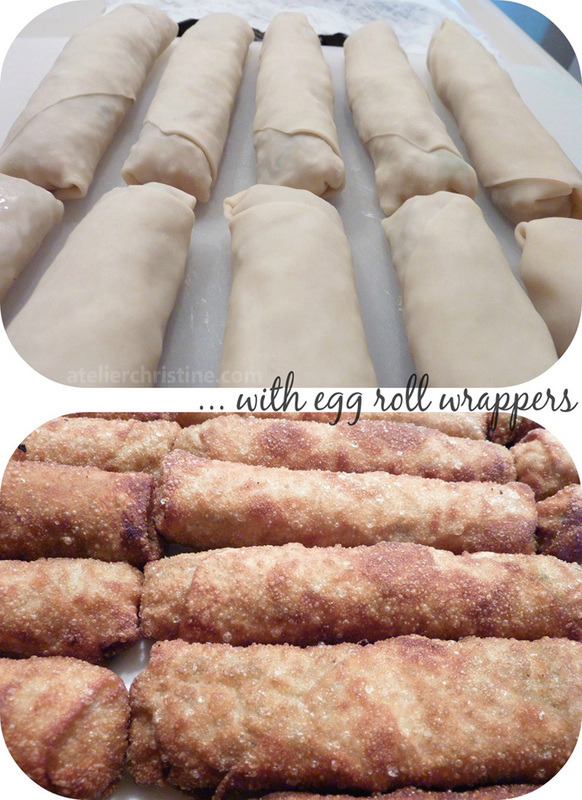 * Sometimes the outside of an egg roll (not spring roll) is dipped or basted with egg wash for extra crunch. ** When you’re ready to serve frozen uncooked rolls, thaw them in the refrigerator before frying. Cook rolls. Pour oil to a depth of 3-to-4 inches in a large heavy saucepan and heat to 350F over medium-high heat. Fry rolls in batches until deep golden brown; thoroughly drain on paper towels. Alternatively, brush rolls on all sides with oil, place them on a parchment lined baking sheet and bake for about 20 minutes in a preheated 400F oven until light brown and crispy; turning them over every now and then. *** Cooked chilled rolls can be frozen; simply reheat them in the oven.